The Formentera Council's department of tourism will be promoting the island at Berlin's ITB travel expo through Sunday March 10. Department chief Alejandra Ferrer travelled to the city to present Formentera to expo-goers as an island where sustainability reigns. The CiF councillor spoke to members of niche press outlets about pioneering sustainability strategies being deployed on Formentera. She talked about the forthcoming initiative to regulate vehicle ingress, the Save Posidonia Project and “the importance of safeguarding our sea and scenery”, which Ferrer called “mainstays of the island's tourist appeal”. The tourism chief pointed out that Formentera's economy is “100 per cent tourism-based” and affirmed: “That's why the balance between protecting the land, wellbeing of islanders and working our competitive edge over other destinations is so crucial”. Getting there will require Formentera develop an identity which sets it apart from the crowd: “We've got to showcase those features that make us unique—gastronomy, culture, traditions, heritage and the list goes on”. Ferrer also talked to ITB attendees about Descobreix Formentera, a push to attract visitors in May and October (that is, before or after the traditional season) with a chock-a-block slate of fitness and cultural programming. She reckoned German tourism is “part of Formentera's lifeblood”, reasoning that travellers from the country “tend not only to be keen on the outdoors and environmentally conscious, but also favour extended periods of family travel outside the high season”. 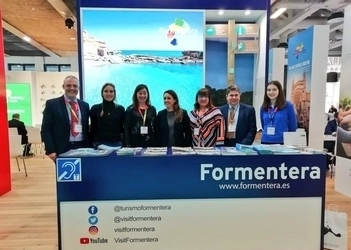 Formentera shares its promotional space at ITB with the other Balearic islands. An island rep is on hand at the stand to talk about Formentera's main draws and play up features like the local network of nature trails (rutes verdes) and opportunities for outdoor family activities, such as guided bird-watching circuits. Friday March 8 marks the start of Saló Mahana in Lyon (France), where Formentera will share a stand with Menorca's tourism office. Ferrer said recent efforts to expand promotional efforts in France are a reflection of how travellers from the country have become a priority. This week Formentera is also taking part in its first Expo Sports Outdoor in Barcelona, part of efforts to promote off-season fitness events on the island.